Tibetan cuisine opts for the simple approach, with most dishes including a mix of grains, meats – commonly yak or mutton – vegetables, and dairy products. Very few spices are used in Tibetan cuisine, so it is great for those who prefer a milder taste, though some dishes do come with an extremely hot sauce on the side should you be missing a kick. 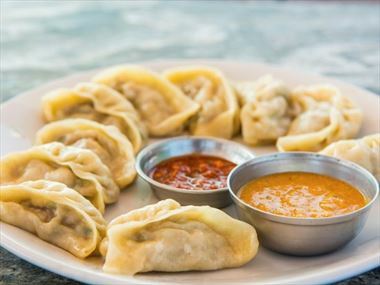 For a traditional taste of Tibet try momos, delicious Tibetan dumplings filled with meat or vegetables. These are best eaten with one hand and dipped in accompanying sauces; though eat carefully as they can be very juicy. Thukpa is another popular Tibetan dish; a hearty, comforting noodle soup served with boiled vegetables or meat. Tibet is not great for vegetarians as they are big meat eaters. Be vigilant as some vegetable dishes are still cooked in a meat broth. For the pure taste of Tibet try salted Tibetan butter tea; black tea mixed with salt and butter. For the authentic taste opt for yak butter, though butter made from cow’s milk is quite common too. It has quite a savoury, cheesy taste, so if you prefer your tea sugary order a sweet milk tea instead – which is usually better for Western palettes. Tea houses are a popular social venue in Tibet, so you’ll be sure to find something that suits your taste. Nightlife in Tibet is usually laid-back and calm, so instead of night clubs you’ll more commonly find locals hanging out in a pub, or at a singing or dancing show. Singing shows, otherwise known as Langma opera, are a very popular pastime in the evenings. Alternatively, locals and tourists head to busy night markets, full of fresh food, crafts and even clothes. Head to Tianhai Night Market; the most popular and busiest market in Lhasa, and try out the delicious plethora of night-time snacks, including momos. Stalls not selling food at Tianhai Market close at 12pm, so if you’re looking for late night shopping, head to the commercial Barkhor Night Market.